Now, just for being a member of Local 101 you can have a lawyer on call 24 hours a day. Through an arrangement with MyUnionLegalPlan, Local 101 has designed a new program for our members which has many free and low cost features. Coverage, for you and your family, includes every legal problem imaginable: criminal, divorce, closings, foreclosure, personal injury, mortgage refinance, landlord tenant, immigration etc. Every member of Local 101 has a Basic membership. For $10.00 per month you can become a Gold Plan member and have numerous additional free benefits: a free lawyer at Traffic Court or following a misdemeanor arrest, a free will, a free separation agreement or uncontested divorce. That same $10 per month gets you a lawyer for $250 at a closing and 10-15% off of the contingency fee in an accident case. 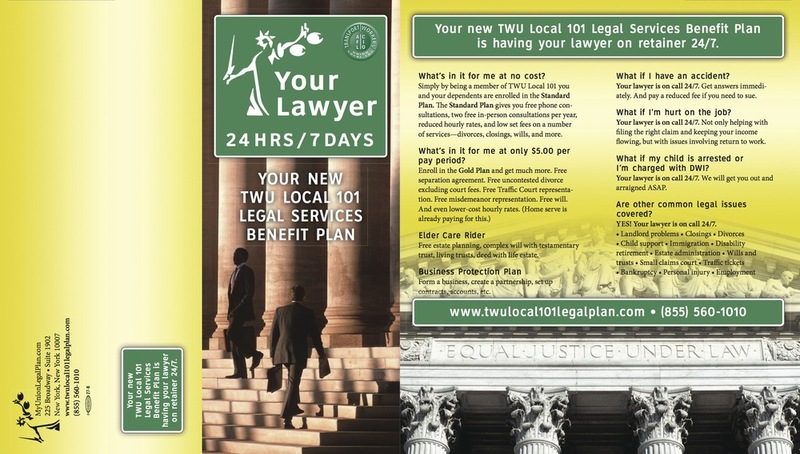 Just click this link at www.twulocal101legalplan.com and get started. The web site takes inquiries; or call 855-560-1010. Please click here to download the MyUnionLegalPlus brochure immediately below. Click here to download the Legal Services Table of Benefits at bottom.